This post will give you all a flavor of my local ‘patch’ as I have not really covered this before, except at the tab at the top of the page. My local ‘patch’ is in Dhahran which is situated in the Eastern Province of Saudi Arabia, between the cities of Dammam and Al-Khobar, and is the headquarters of Saudi Aramco, the state owned national oil company of Saudi Arabia. Dhahran is about 10 kilometres from the western shore of the Arabian Gulf and fifty kilometres via the causeway to Bahrain, and rises progressively from sea level to a maximum altitude of approximately 150 metres. The geology consists of sedimentary marine deposits of the Arabian Shelf, laid down during the late Tertiary, when the area was subject to intermittent submergence and deposition of sediments. 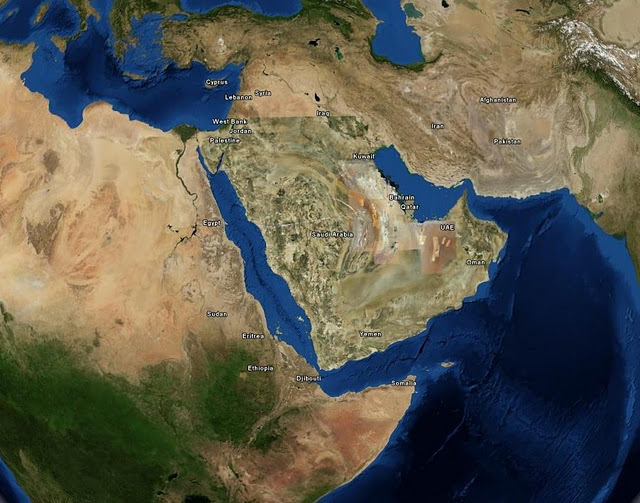 The Eastern Province is classified as Persian Gulf Desert and Semi-Desert and is a flat desert plain with a width of 80 km and a length of 1200km, spreading over an area of 778,500 square kilometers and making up 36% of the Kingdom of Saudi Arabia. The climate is classed as ‘arid’ and is characterized by hot, often humid, rainless summers and cool winters. In summer the daytime temperatures from April to October regularly rise above 40 °C and occasionally exceed 50 °C although in winter (December and January) temperatures drop to around 18 °C during the day and 10 °C at night with occasionally nighttime lows of 2 °C recorded. Average Rainfall is 75 millimetres with most occurring between November and January. The Shamal winds usually blow across Dhahran in the early months of the summer, bringing dust storms that can reduce visibility to a few meters. Dhahran Camp, Saudi Aramco's compound, is a man-made environment, where a remarkable greening of the environment has occurred, which now helps support a varied range of flora and fauna, including a variety of birdlife. This greening has been made possible by the use of reclaimed and treated water for irrigation and the planting of many thousands of exotic trees and shrubs, which has dramatically enhanced the area's potential for migrant, wintering and breeding birds. Water, needless to say, is a precious commodity in Saudi Arabia and “Raw” water used for landscaping, is chlorinated brackish well water with a high level of total dissolved solids and makes up roughly 70 percent of all the water used in the community. Reclaimed water from the Dhahran Advanced Wastewater Treatment Plant (AWTP), which treats 10 million gallons a day, is treated to make it suitable for unrestricted irrigation. The biggest use of reclaimed water in the Dhahran community is for landscaping in common areas, public parks, playgrounds, gold course and athletic fields, all of which are attractive to birds. Spray fields, a percolation pond (formerly called Lake Lanhardt) and waste treatment ponds are also part of the waste water treatment system. Ponds and areas like this are very scarce in Saudi Arabia and as a result are very attractive to wildlife and birds in particulalr. The percolation pond is fringed by quite extensive reed beds, although as I write these have been grubbed up - although they are regrowing after only one month, and is surrounded by tamarisk trees and behind this by stony scrub desert made up of limestone, sand and gravel. Vegetation is characterized by a thin sprinkling of small shrubs, grass tussocks and occasionally large shrubby growth such as tamarisk. Variety is limited, with a small number of plants dominating the land. The presence of numerous small pools, landscaped areas of grass and trees, and the grounds of the golf course, all add to the attraction of Dhahran Camp for migrating birds. 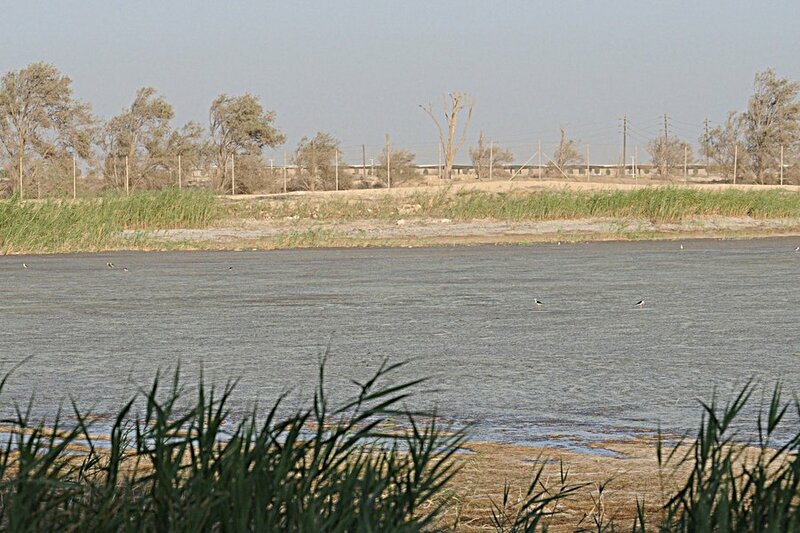 There are a number of excellent habitats present in Dhahran camp as mentioned above with the single best site being the percolation pond, which is a large 4 hectare (10 acre) sewage effluent pond that is surrounded by Phragmites reeds (Phragmites australis). The pond, previously called Lake Lanhardt, is an oasis on the edge of the desert, as water areas like this are very scarce. It is a magnet for migrating and wintering birds with Tamarix (Tamarix aphylla) trees screening part of the perimeter and Banyan (Ficus benghalensis), Mesquite (Prosopis juliflora) and Tamarix (Tamarix Arabica) all growing nearby. The pond is part of a complex system of water treatment and water re-use that is used in Dhahran camp and is fresh-water. Previously fish were present in the pond but recent draining and removal of Phragmites reed beds in both 2009 and November 2011 have probably removed them. Some Phragmites reeds still grow in low lying, wet areas, outside the perimeter fence of the pond, which are often inundated with water during the winter period. Water leves at the pond are controlled by large inlet and outlet valves and are generally high in the winter months dropping significantly in the summer. This is because water demand can be four times higher in summer compared to winter and a balance of supply has to be made between the sod farm, percolation pond, grass golf course and public areas. In winter many duck species use the ponds and there is a night-time roost of 2500 Great Cormorants that make a fantastic visual sight as they all come to roost in the late evening. Herons of various species and waders also find the muddy edges of the pond to their liking and migrant water birds or passerines can be found in the area. 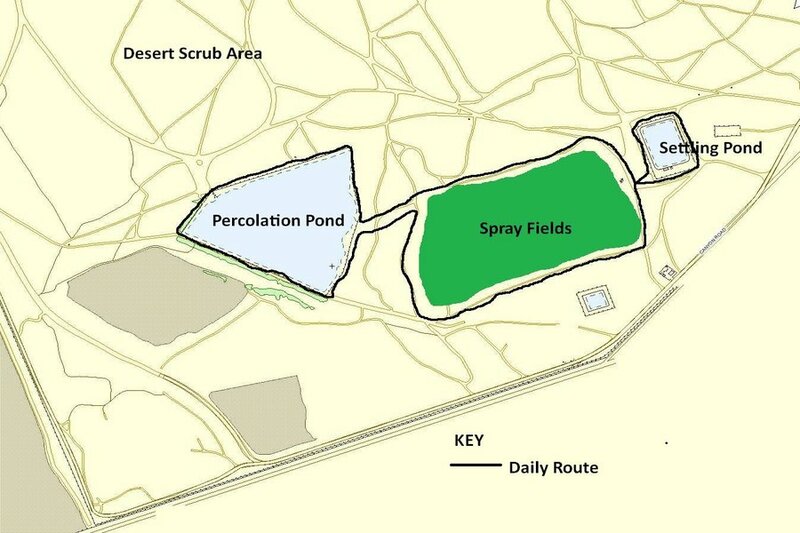 The next best habitat is the spray fields, and the watering of these fields is linked with the percolation pond, often with water being sprayed onto the fields when the pond is full. These fields have rotational spray heads that are excellent perches for birds, especially shrikes, and distribute the water over large areas making the habitat green and attractive to birds especially migrants. The area is green for much of the year and has numerous grasses with plenty of seed suitable for a number of species of bird. Free-standing areas of water are also present if the spraying has been going on for some time although this water soon drains away. This free-standing water is attractive to passing waders and the fields are good for hunting harriers in the main migration periods. One edge of the spray fields has a raised embankment with Tamarisk trees which is excellent for migrant warblers in the spring. Other good habitat especially for true desert species on the camp are the jebals (mountain in Arabic), which are limestone escarpments up to 50 metres higher than the surrounding area. These are good for wheatears, rock-thrushes and larks as well as other birds and have many nooks and crannies in them that have in the past attracted Pharaoh Eagle Owl and Little Owl. 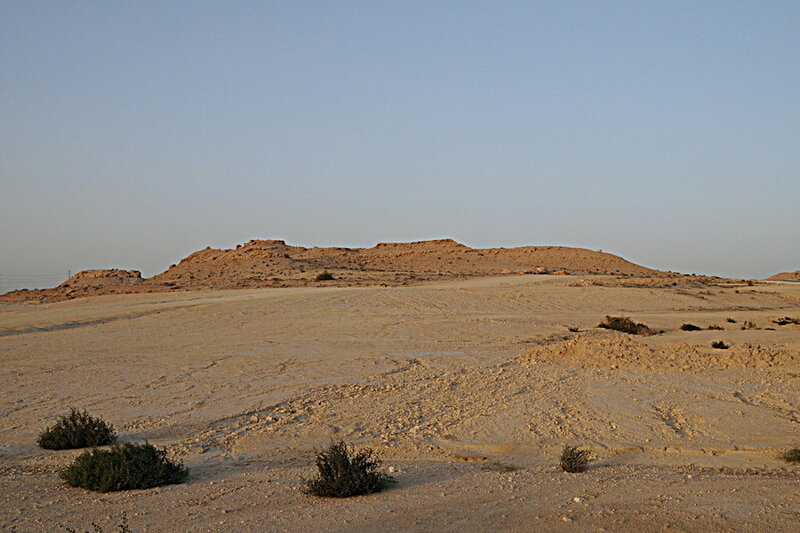 Nearby to one of the main jebals are the scrubby desert and tussock grass areas. These areas are good for pipits and buntings. The scrubby desert area is mainly hard packed sand with a silty crust interspersed with small clumps of vegetation, mainly grasses. This is the area where the majority of Arabian Spiny-tailed Lizards (Uromastyx aegyptia microlepis) live. As it is a flat wide expanse of land it is also good for looking for birds of prey, flying over or resting on the ground. The tussock grass area flourishes after rain and attracts a lot of insects and butterflies as well as birds such as wheatears. The last really good areas are the main recreational areas such as the 18 hole grass golf course, football fields and parks, as they have mature trees and shrubs. The golf course cannot really be birded as for some reason people want to play golf on it rather than bird-watch, although I am sure it turns up many good birds. The edges can be looked at and hold plenty of migrant passerines at the right time of year. There are a number of reasons why Dhahran is so attractive to birds with the amount of water available in a water scarce region being one. The fact the location is on or near major migratory flyways is a major advantage with it being right in the middle of the East Asian / East African flyway, and is also encompassed by the Central Asian flyway as well as being just outside the Black Sea / Mediterranean flyway. Other advantages for the location are that the major development of Dammam, Al Khobar and Dhahran over the last twenty years has caused significant loss of habitat outside the camp. This has led to landfilling, dredging and coastal development as well as solid and liquid waste disposal causing major reduction in safe havens for birds. Associated with this is the loss of 46% of the mangroves (287 hectares) in the region since 1973. As a result Dharan camp is one of the last remaining safe haverns for many species of birds in the region. Not all is doom and gloom on the mangrove front at least, with Saudi Aramco having planted or planning to plant one million mangroves by 2014. This combined with projects to help remediate the Gulf oil spill of 1991, which was one of the largest oil spills in history, are significantly improving the environment in some strategic areas. Over 200 species of bird have been recorded in the camp, which is approximately 75% of all the species recorded in the Eastern Province of the Kingdom of Saudi Arabia and in less than one year birding I have personally seen 170 species of bird. I recorded 19 species of bird breeding in the camp in 2011, which is 51% of all birds breeding in the 50 x 50 kilometre square in which the site is located. Peak migration times are March to May and August to November with the spring migration period being the best for both number of birds and number of species. The first spring migrants are already starting to turn up with Barn Swallow & Pallid Swift arriving in small numbers. Soon the real migration period will start and I am really looking forward to it.